Those who have seen him on TV, or in his extraordinary live shows, know that Derren Brown is an astonishing, mesmerising, and utterly baffling talent. His brand of psychological illusion uses elements of magic, suggestion, psychology, misdirection and showmanship. Whether he appears to be reading people’s minds, contacting the dead, guessing people’s dreams, or telling them their detailed medical history just by looking at them the results seem to defy logic. Yet what’s refreshing about Brown is his open and honest approach to what he does. He cheerfully reveals that he can’t read people’s minds or commune with the afterlife – his skill is to make it look like he can. 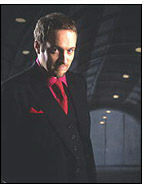 His most recent TV programme Derren Brown: The Heist was the most ambitious and challenging of Derren’s specials to date. Under the guise of a motivational seminar and a follow-up documentary, Derren set out to persuade a group of responsible, middle-management businessmen and women to steal £100.000 in an armed robbery and illustrated how little it takes to cross into deviant behaviour. We all know what happened, but how did you come up with idea in the first place? Were you pleased with the reaction? Yes, it was very well received. I felt it was the best thing I’d done so far. The reaction I was most concerned about was that of the guys who actually went through with the robbery. It was very important to me that they were comfortable with their involvement. I had them come along to the screening before it was broadcast and they were really happy with it. That did mean a lot to me. Some quarters found it offensive. How do you feel about the controversy that sometimes surrounds your work? I take it as a signal that I must be doing something right. You have a new series of TRICK OF THE MIND coming up. What can you tell us about it? How different is it to the previous series? It follows the format of the previous series, only this time I get to go abroad. The first series was all in London, and then the next was across England, so it made sense to go world-wide for segments of this series. Of course I was very opposed to the idea of being handed any sort of exciting paid-for holiday and it was only with great reluctance that I suggested we go and film the US, in Venice, Vienna and Monte Carlo. Not sure where to go for the next series. ‘Moon Control’, maybe. Also, the feel of the series is a little different: we’ve shifted things away from the cool 60’s look of the previous shows to a darker 50’s tone. Has a more Hitchcocky feel, I suppose. I think it looks rather good. And it means I get to occasionally wear my trilby which I’m more than happy with. Can you tell us what you do with your celebrity guests? But one of them gets to bleed quite nastily and Matt Lucas is absolutely dumbfounded. You've said that The Heist, to date, is the most challenging programme you've done. So what could you do to top it? Are there plans for another special? There are certainly plans for another special at some point, but it’s too soon after the last to decide yet. I tend to hide out for the latter half of each year making the shows and keeping off the screen. I don’t think in terms of topping each project; I just try and make things which I find raise interesting questions and will be dramatic to watch. I’m sure a lot of your fans are pleased that SOMETHING WICKED THIS WAY COMES is back on the road, but why did you decide to do it? At the moment I’m working to the pattern of writing a new show every two years. Because the tour last year sold out pretty quickly, which is very nice, it’s worth extending it to this year in cities which didn’t get it last year. There are some controversial moments in the show. What reactions did you get to them last time round? There are a couple of moments in the show which sometimes cause a strong response from sensitive people. I try to tap into different emotional responses throughout the couple of hours or so I’m on stage: some of it’s funny, sometimes you don’t want to look, and in some parts are very tense and you can hear a pin drop. I think it’s a very enjoyable ride. I hope it is. Is it exactly the same show or can we expect a few surprise extras? If anyone decides to come back again, I imagine there’ll always be things which go a little differently from night to night. I’m planning on tightening up a couple of things I felt may have been a little slow last year and seeing if I can improve anything of course, but it’s essentially the same show. Certainly if anyone saw it last year and is coming back, they should realise it’s the same show. There are 42 dates on this tour. What do you do to relax between shows? I tend to get bored and fidgety, wanting to get back on the road to do the next one. The buzz of a real audience, and knowing that you’re giving them a good show, make it hugely enjoyable. But I suspect this time I’ll be working on a book project. I’m thinking about making the shows in America for the TV there, and I think I’ll be writing a book about it all. I get asked a lot about how I do it, and it would be good to be able to point people towards a fairly comprehensive book that would help. I’m also looking into an exhibition of my portraits (a hobby which has now become more serious: there’s a gallery on www.derrenbrown.co.uk), and imagine I’ll be buying a lot more rubbish off E-bay.